IWI TAVOR SAR or X95 Bolt Conversion for 5.56NATO or 300BLK! Bullpup Armory is a CERTIFIED IWI TAVOR ARMORER! Send us your TAVOR SAR or X95, and we'll switch the ejection to the other side per IWI specs. When you get your rifle back, you'll have the new configuration, plus the original bolt, for when you need to switch back to the original configuration. Fastest turnaround times in the industry! Made in the USA! Hi-Tech Customs has improved on the simple KSG single sling attachment point by offering a QD attachment point. Allows you to attach any QD Sling or QD Swivel to your KSG. CNC Machined from Steel Plate and 2024-T3 Aluminum, the attachment locks into place with no modification. Complete directions included for an easy do it yourself install. Q.D. Block is Black Hard Anodized to Military spec MIL-A-8625 Type III Class 2 for Steel like Strength without the weight. IWI TAVOR SAR Bolt Parts Kit - 5.56 NATO "Survival Kit"
A complete drop in spare factory fire control pack for your Tavor® X95. This fire control pack will work in both SAR and X95 receivers. Reduces trigger pull weight when compared with the original Tavor® SAR Essential factory spare bolt parts with spare firing pin, firing pin spring, and other bolt parts for your Tavor® SAR or X95 in 5.56 NATO. Broke your pivot?! Here's a spare barrel pivot lock for your Tavor® SAR or Tavor® X95™. You will need a Tavor® Barrel Wrench Tool to complete the process. Spare factory firing pin and firing pin spring for your Tavor® SAR and X-95 in 5.56 NATO Did your PS90 come with a 30-round magazine? Replace the limiter with the Percival Armaments Locking Plate, and give it a 50-round capacity! Quick and easy fix!! Made in the USA! LOADER - 10 round black Zytel nylon magazine charger for 5.56 AR-type Mags. Fits all Thermold 5.56 mags, as well as Lancer and PMags (any "AR" mag really...) Use with stripper clips or individual rounds for a smooth, quick feed. IWI TAVOR SAR & X-95 Barrel Lock Wrench. Made from 17-4PH Stainless, with a rubberized handle. Hardened strength, corrosion resistant, and a comfortable grip that won't scratch your Tavor! Always refer to the IWI Owners Manual when disassembling-reassembling a Tavor/X-95. Made in the USA! All-in-one magazine speed loader (and unloader) for 9mm Tavor® magazines (ASC and IWI). This small, lightweight, reinforced-polymer device is durable, and simple to use in either mode (loading or unloading). Prolongs magazine life, by eliminating wear on the feed lips during loading-unloading. Reliable in all weather, the LULA is tested and combat proven. Complete Stock Screw Set for the P90/PS90. Just in case you've lost a screw or nut, or that just wants some spare parts ! 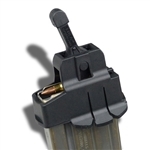 All-in-one magazine speed loader (and unloader) for all metal and plastic 5.56mm / .223 magazines, including PMAG’s and Lancer. 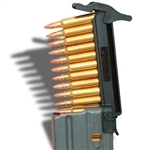 All-in-one magazine 10-round strip loader (and unloader) for all metal and plastic 5.56mm / .223 magazines, including PMAG’s and Lancer. This small, lightweight, reinforced-polymer device is durable, and simple to use in either mode (loading or unloading). Loads both 10-rd Stripper clips and 10 loose rounds. Reliable in all weather, the LULA is tested and combat proven. We have been asked about a cap for the PS90/P90 mags over and over, and we've not been able to get them from FN. So Percival Armaments stepped up! A matte black plastic (Nylon and Carbon Fiber) Cap that fits the FN PS90 Magazine as a dust cover. Great for storage, or to protect loaded mags from the elements. Factory Barrel Wrench for barrel removal from your Tavor® SAR or Tavor® X95™. ShootingSight LLC has developed a customized multi-tool specifically for the IWI Tavor®. Contains the critical tools to maintain the rifle, including: Barrel Removal Tool, Screwdriver to adjust the front sight windage, Phillips Screwdriver to remove handguards, Hex Wrenches to remove top and side rails, Awl to lift out spring pin in swivel, Hex Bit Socket to allow customized tips for any optics ( hex tips available at most hardware stores). NOW INCLUDES A 3mm HEX BIT FOR THE X95! Add a PALS/MOLLE Pouch in Black,Tan, or ODG for just $5 more! Tav-Tool made in the USA! Factory New Sight Adjustment Too for the PS90 from FN. This simple, yet effective tool allows operators to perform all field maintenance and repairs. Manufactured from 4140 steel in the USA, this phosphate-finish tool will be the go-to item for sight adjustments, rail removal or disassembling the gun. A Stainless Steel Barrel Nut Remover specifically for the Kel-Tec KSG Shotgun. This product, from Hi-Tech Custom Concepts, safely slips on over your entire Barrel Nut and firmly holds on as you unlock the nut. Will not slip off and damage your gun finish. Always refer to the IWI Tavor Owners Manual. 12" x 36" x 1/8" thick Magazine shaped cleaning kit. Available as a full kit (see Extended Information tab), or as an empty box ($19.99) for your own gear. Developed by Top Shot's Peter Palma and Made in the U.S.A.!